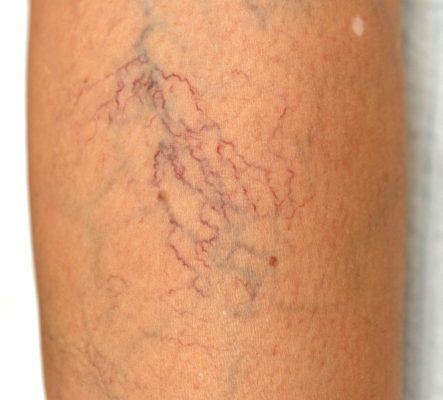 Spider veins affect many people, but there are things you can do to reduce your risk of developing them. The following tips not only help to prevent spider veins, but also reduce discomfort caused by existing vein problems. Sun damage reduces the amount of collagen that your skin cells make. This reduction in collagen makes skin thinner, which in turn makes blood vessels more visible. Wearing sunscreen blocks UV radiation, reducing sun damage and therefore making spider veins less likely. Regular exercise strengthens veins and improves circulation. To reduce your risk of developing spider veins, spend as much time as possible doing leg exercises, such as running and walking. Being overweight puts more pressure on the veins in your legs, which increases the risk of them becoming damaged. Use a sustainable exercise routine and healthy, balanced diet to gradually lose weight. Standing still for a long time places pressure on your legs, which can damage the veins inside them. Reduce the damage by shifting your weight frequently if you must stand for a long time. Sitting is also a problem, particularly if you cross your legs while sitting, because it causes blood to pool in the legs. Take regular breaks from sitting by getting up and moving around. Low-heeled shoes stretch and tone the calf muscles, helping blood flow more freely through the veins. Loose clothes also encourage blood flow through the lower body. Avoid tight waistlines, skin-tight jeans, elastic support stockings, and clothes that are too small. When you are resting, take the strain off your legs by elevating them above the level of your heart. Putting your feet up while you are watching television or reading helps blood to flow out of the legs and back to the heart, reducing pressure on the veins in the legs. If you already have spider veins and want to find out what treatment options are available to you, schedule an appointment with a physician today. This allows you to make sure you don’t have an underlying condition causing the spider veins. Spider veins may be a sign of vein dysfunction deeper in the leg, a condition known as venous insufficiency. Often people have chronic venous insufficiency and don’t even realize it. They may have heaviness or discomfort in their legs at the end of they day and attribute this to old age or to hard work, but it is actually vein disease. Seeing a specialist is very important. If you have pain, swelling, or heaviness associated with your spider veins make sure to see an expert doctor.